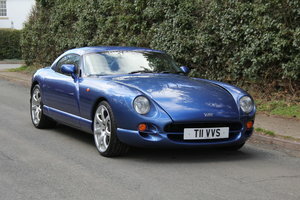 The ultimate TVR Cerbera 4.5 AJP 420bhp version with only 18,574 miles. Fixed roof coupe with integral roll cage, laminated sundym windscreen, frameless electronically operated doors, jig formed multi tubular steel frame chassis, oil pressure and water temperature gauge, ice detector, gear shift light, engine start and stop buttons, clock, electric windows, electric mirrors, lumber support, alarm engine immobiliser with remote locking, electronic key control. 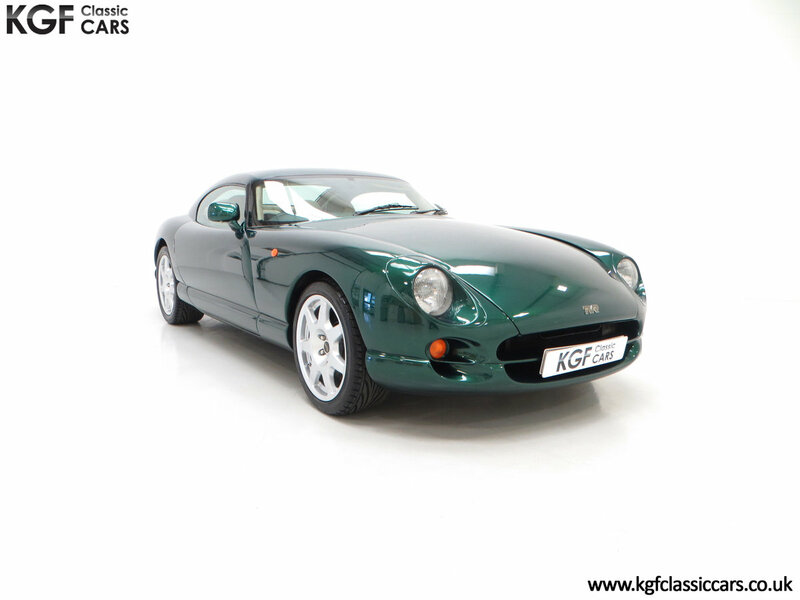 Factory options: TVR tread plates, full hide trim including rear parcel shelf and doors, wool carpets, TVR carpet mats, air conditioning. 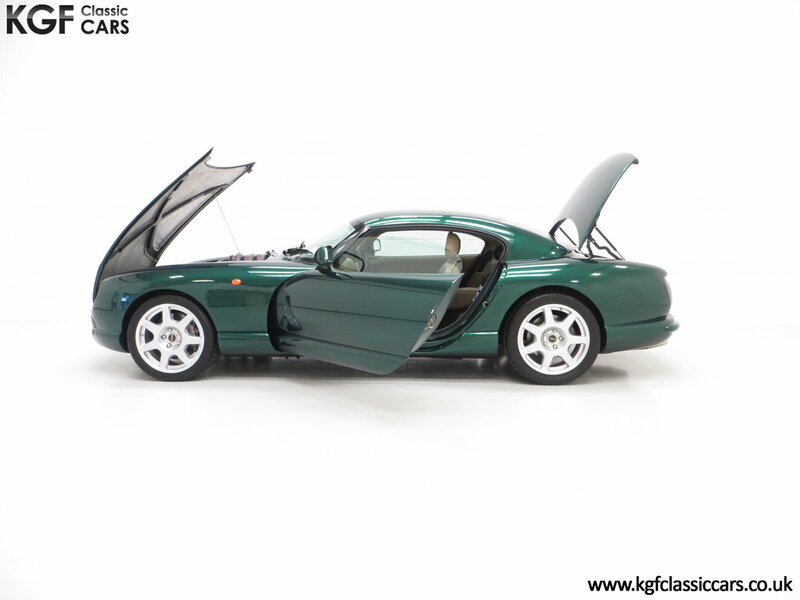 Truly spectacular finished in cost optional Starmist Green, the paint sparkles and has an incredible deep gloss finish thanks to a minimum of five coats of topcoat applied at the Blackpool factory. The patented electronically operated doors open by pressing a button under the door mirror which eliminates the need for exterior door handles enhancing the sleek and sculpted body and reducing aerodynamic drag. A few tiny stone chips to the front bumper and bonnet have been neatly touched in and the very lower tips to the sundym windscreen have discoloured, but barely noticeable. Two TVR gel badges, one to each door, have been attached to protect the edges and a TVR Car Club sticker is visible to the front screen. The phosphated and power coated tubular steel fame chassis is in excellent condition having always been garaged from new and covering just 18,574 miles. Dramatically styled and individualistic in the extreme, this car is stunning. 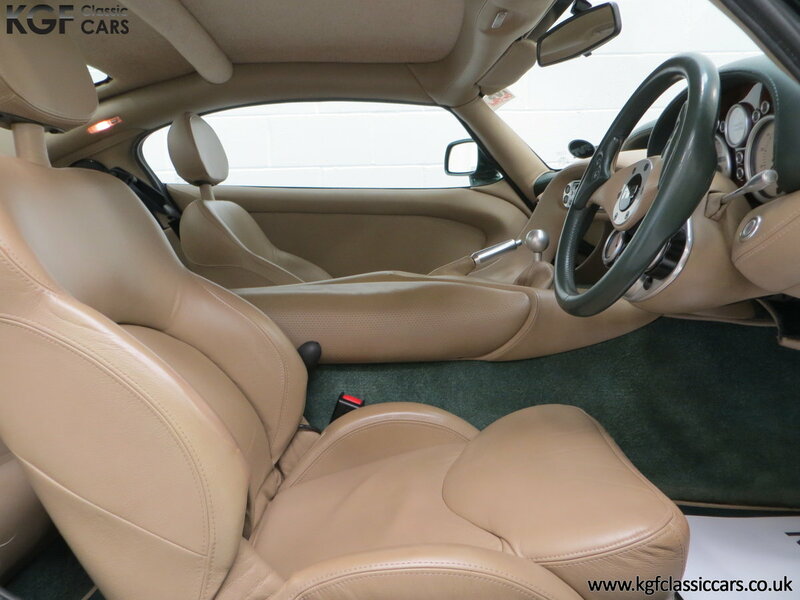 This highly specified example has the full hide trim including the rear parcel shelf and door inserts finished in Doeskin, a cost option of £3,450 when new and are in fabulous condition with just a few marks to the drivers seat bolster. The optional Brooklands Green wool carpets are spotlessly clean and all the unique conceptual instrumentation is fully operational. The two-spar steering wheel allows easy viewing of the minor gauges below and like the rest of the interior trim, is in excellent condition thanks to the low mileage covered. The sense of occasion as soon as the start button is pressed with all the TVR wizardry and sporting prowess will guarantee exhilaration time after time. Very special. 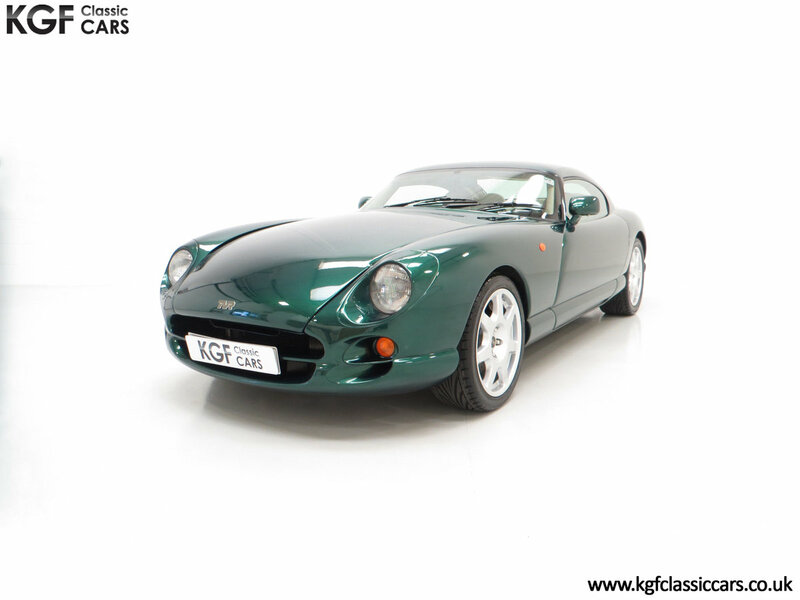 The TVR Cerbera is the first model to be driven by TVR’s own engine, a 75-degree V8 with a flat-plane crank. Peter Wheeler informed all that “from the bottom-half of the engine to the heads is exactly as you would see in current Formula One engines." The result was dubbed the "Speed Eight" (official designation 'AJP8') after Al Melling, John Ravenscroft and Peter Wheeler. Specified in the most desirable guise, the 4.5 litre 420bhp version in a car weighing just 1140kg was enough to propel it from 0-60mph in 3.9 seconds and on to a top speed exceeding 190mph. Regular maintenance and expert owned ensures optimal performance. The five speed manual transmission offers direct short throw changes and the spherical aluminium gear knob is a superb finishing touch. Unique to the Cerbera 4.5 are the 8x17inch front and 8.5x17inch light alloy wheels sporting Toyo Proxes 235/40 ZR17 and 255/40 ZR17 tyres respectively with ample tread. Powerful aluminium four-piston AP Racing calipers operate on huge ventilated discs on all four corners capable of taming the explosive performance on offer and bringing the car to halt in 2.8 seconds from 60mph. 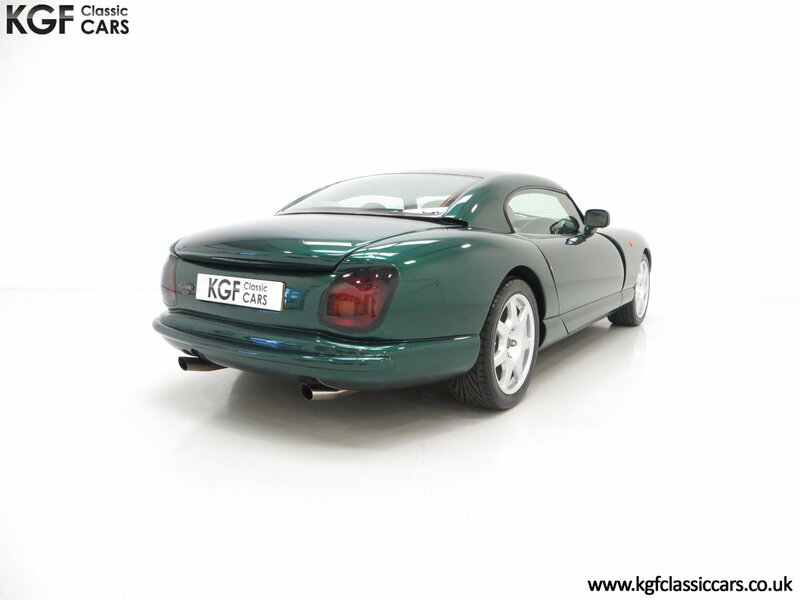 This cherished and enthusiast owned TVR Cerbera 4.5 was supplied new on the on the 24th February 1998 by main dealers, TMS Performance Vehicles of Melton Mowbray. The first owner, Mr Fraser, specified the car at a cost of £53,522 as revealed by the New Vehicle Invoice. With just three former keepers since, the last Mr Andrew James Hutcheson purchased the car in April 2007 with just 9,000 miles. Mr Hutcheson is highly regarded in the TVR Car Club and indeed was the Editor of the TVR Clubs Sprint Magazine Wedge Expert. Mr Hutcheson would proudly buy a new TVR every year at the Motor Show and part exchange his current TVR and pay just £3000. He was the first private individual to own a Speed Six and at one point had 14 TVR’s in his collection! This car was often on display on the TVR Car Club stand at shows and exhibitions. 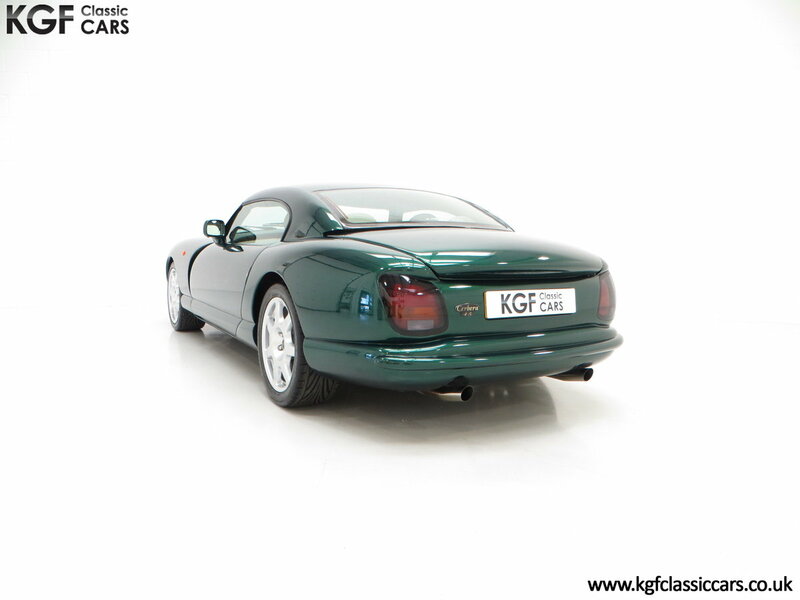 His knowledge, dedication and experience in all things TVR will help ensure that this Cerbera, being one of his favourites is a prime, pampered and well sorted example. Mr Hutcheson would be only too pleased to assist the new owner both prior and during ownership should they wish. Supplied with a folder full of invoices, all handbooks in the black leather wallet, spare keys and brochures. 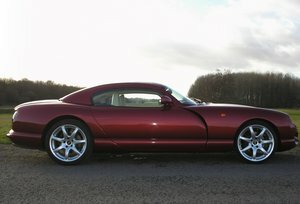 The vehicle also has a private TVR registration number and indoor car cover.